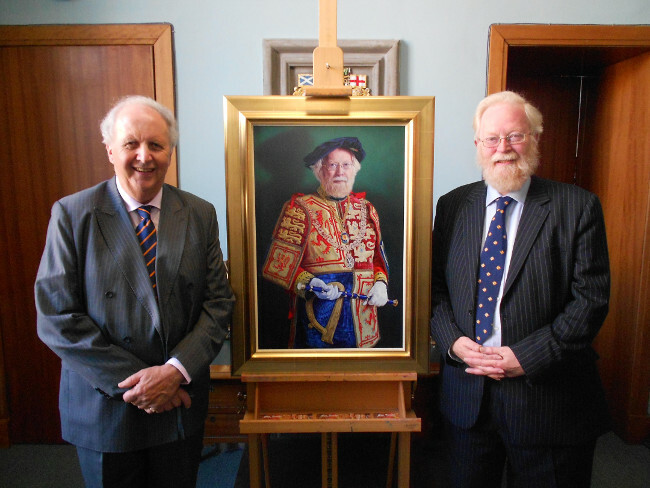 Before unveiling the portrait, Professor McCall Smith said: “We have always so appreciated David’s scholarship, his kindness and his generosity of spirit. The portrait shows Lyon Sellar in his tabard, worn for state occasions, with his baton and collar of office. Mr Sellar was appointed Lord Lyon King of Arms in 2008, following a distinguished career as a legal historian at The University of Edinburgh. Upon his retirement in 2014 he was appointed Islay Herald Extraordinary and was made a Member of the Victorian Order in the 2014 New Year’s Honours List. The Lord Lyon King of Arms is appointed by HM The Queen to oversee heraldry and state ceremonial in Scotland. The office is first recorded in 1399. A series of portraits of former Lord Lyons hang in the Lyon Office in New Register House, Edinburgh. The current Lord Lyon is Dr Joseph J Morrow, who was appointed 2014.